The working principle of a sucker rod pumping unit, as well as its components, have been detailed in a previous article titled: “Beam Pumping Unit Principles and Components”. This article will focus on the names of surface components of sucker rod pumps used in different languages, namely: Arabic, English, and French. NB: As a reminder, beam pumping unit is a machine for translating rotary motion from a crankshaft to a linear reciprocating motion for the purpose of transferring mechanical power to a down-hole pump. The purpose, simply stated, of the basic system is to transmit energy from the surface to the downhole pump. 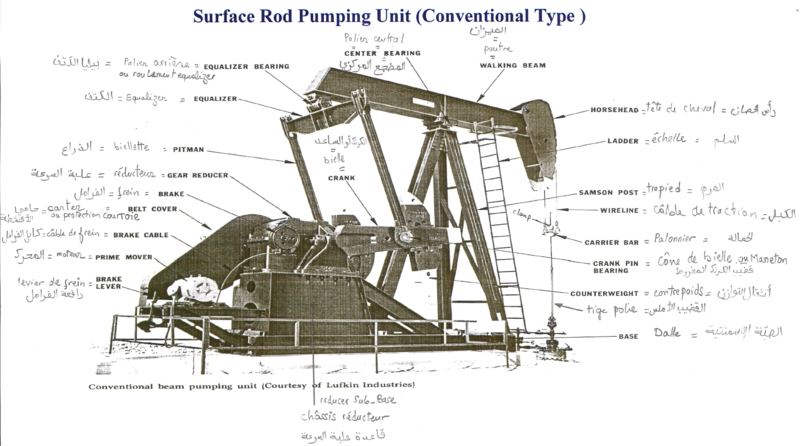 The following figure depicts the main components of a surface sucker rod pumping unit (conventional type in this case). Tagged belt cover, biellette, Brake, brake cable, brake lever, câble de frein, Carrier bar, carter, châssis réducteur, Equalizer, equalizer bearing, frein, Horsehead, levier de frein, moteur, oil level plug, Pitman, polished rod, poutre, prime mover, Reducer Sub-base, Samson post, stuffing box, Surface Components, Surface Components of Sucker Rod Pumps, trépied, walking beam, wireline. Bookmark the permalink.